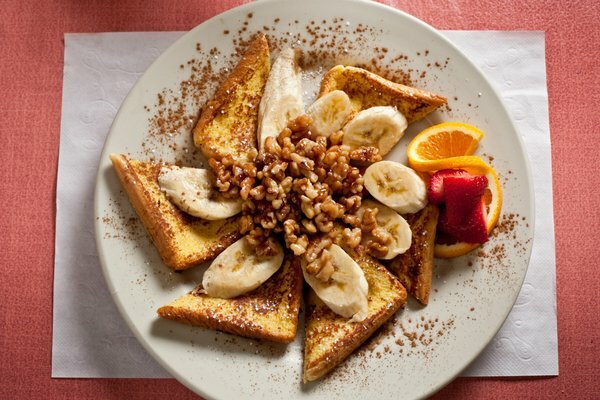 Experience delicious food at Nudy’s Cafe where the large menu has something for everyone. You will enjoy the relaxing atmosphere and attentive service while dining with friends or family. If you come in for breakfast you can order meals ranging from Eggs Benedict and omelets to pancakes, breakfast sandwiches, and crepes. We recommend the Lox & Cream Cheese Platter that has smoked salmon, sliced tomatoes, capers, red onion, cucumbers and cream cheese that is served with a toasted bagel. Also, their original omelets are very tasty. Try the Cheese Steak Omelet or for something different or go for the Seafood Omelet that is filled with shrimp and crab meat, tomatoes, and pineapple – then topped with avocado. Lunch and dinner at Nudy’s Cafe means having an even larger menu to choose from. Try a Buffalo Chicken Wrap, Classic Ruben, Hot Roast Beef Sandwich, a California Burger, Salmon BLT, and so much more! Vegetarians will love the Harvest Sandwich that comes filled with grilled portabella mushrooms, eggplant, zucchini, spinach, roasted red peppers, and feta cheese – all served on focaccia bread for only $7.99. Another healthy option is the Blackened Tuna Salad that is comprised of spring mix, tomatoes, cucumber, hard-boiled egg, walnuts, dried cranberries, and citrus vinaigrette. If your mouth is already watering, then why not stop by Nudy’s Cafe today? They are located at 450 Bridge Street in Phoenixville, PA. For more information, call (610) 933-6085 or visit their official website.